A magazine is allowed one or two missteps, right? Well … last month was a major blunder for Marie Claire with a total dud of a cover featuring Jessica Chastain, Ava DuVernay and Constance Wu, according to our forum members. No doubt hearing our cries of disappointment about such a missed opportunity, the magazine stepped up their game immensely for May 2019 — and we’re here for it. 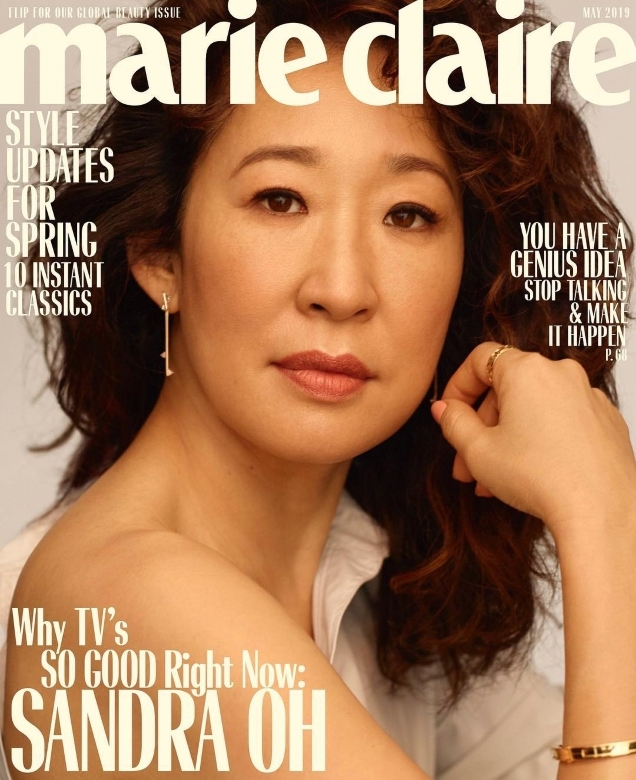 Returning to full form, Marie Claire‘s latest is headed by actresses Sandra Oh, Thandie Newton and Elisabeth Moss. The ladies each received their own stunning solo cover for the occasion, photographed in the studio by Thomas Whiteside with Shiona Turini on styling duties. We’ll race you down to the newsstand for this one! “Sold. Marie Claire is really killing it! And also, Allure, kindly take notes. This is how you feature someone’s beauty while wanting to go au naturel,” raved MON. “Wow, FLAWLESS! Love Sandra and love this beautiful portrait,” chimed in phungnam96. “Wow, these covers are beautiful. Not glamorous, quirky, or raw — just beautiful. And that’s so rare on the newsstand nowadays,” Benn98 applauded. “I am here for this. All three cover choices are covers are strong. Love Sandra especially,” wrote honeycombchild. “Eat your heart out, Vogue. This is truly stunning. All three covers are beautiful and such deserving cover choices,” echoed [Piece Of Me]. “Thank God they’ve redeemed themselves after that awful group cover last month. These are beautiful! Thandie’s is such a perfect classic glossy shot that I’m immediately drawn to it, but I love Sandra’s too,” posted forum member 333101. In love with the covers just as much as we are? Share your thoughts and see more here.